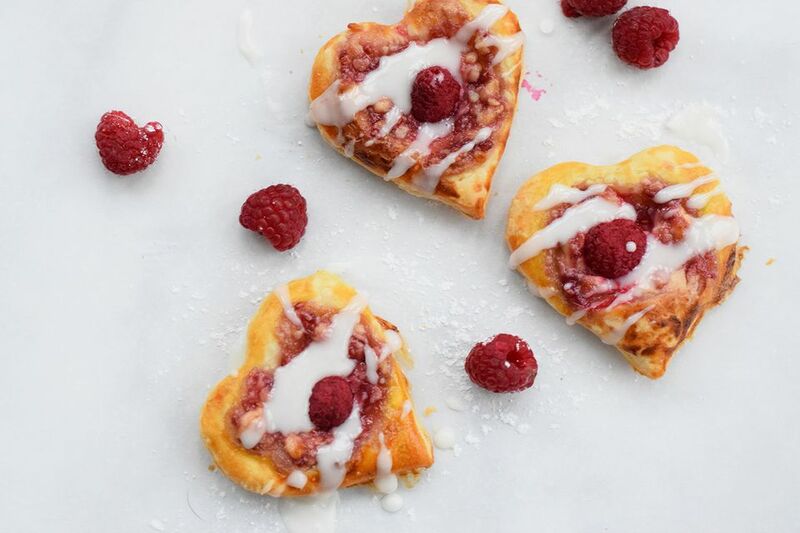 Raspberry and cream cheese are a sweet combination in these delicious little pastries. They are easy to whip together and make an impressive Valentine's Day breakfast! Puff pastry works the best for making these sweet little berry danishes, but if you are in a pinch and don't have time to defrost puff pastry -- or you just prefer the flavor of the crescent rolls -- you can use refrigerated crescent roll dough. It will puff up in a similar way, but it has a slightly different flavor. Just make sure the cream cheese is softened before combining it with the jam! Thaw the frozen puff pastry sheet on your countertop. It should take around 30 minutes to thaw, but it may take up to an hour. Keep an eye on it and cover it with a very slightly damp towel if it feels like it is drying out. After the dough has thawed, preheat the oven to 400 F.
Unfold and place the puff pastry on a sheet of parchment paper. Roll the dough into a larger rectangle. Use a medium sized heart shaped cookie cutter to cut out about 10 to 12 hearts, depending on the size of your cookie cutter and how thin you have rolled the dough. Prick all of the hearts about three times with a fork. Place them on a fresh piece of parchment paper on a baking sheet. Make sure they are spread about one inch apart, as they will puff up. Beat together the softened cream cheese and raspberry jam together in a small bowl. Place about 1 tablespoon of the raspberry jam mixture into the center of the hearts. Leave about a 1/8-inch section around the edges of the mixture. Place one or two fresh raspberries over the center of the jam mixture. Bake on a center rack for about 15 minutes, depending on your oven. The edges should be a light golden brown. Drizzle the glaze over each cooled pastry and enjoy!